1m green plastic party ribbon 5mm thick. Paint for hat in chosen colour and green paint for leafs acrylic so that your paint does not run into wool when glue on as it is waterproof. Fold one of the paper plates in half and cut out as shown. This makes the brim of your Easter bonnet. Cut 8 slits dived evenly as shown. Glue slits together by over folding the edges by 1cm. Paint hat in chosen colour with acrylic paint. Paint on both sides the inner circle left over from making the brim in green acyilc paint. The fold again and draw a semi circle with a 10p as shown. Open out ready to make leafs. Cut into 4 to make hearts as shown. Fold yourA4 sheet of paper as shown and cut of end to make a square. Fold square in to 4. Cut into four as shown. Fold the top point down to the bottom point on each side over as shown. Then draw a semi circle as shown with a 2p. Open out to make a flower. I made my A5 sheet of paper by cutting a A4 in half. Repeat as before with larger flower but use a 5p for semi circle. Now curl petals with a pencil or end of paint brush as shown., to make them more 3D. Add woll with P.V.A as shown make up your designs, let your imagination play. Fun and endless possibilities with your own design. Glue together the flowers with the small one in the center as shown. Add buttons for flowers center. Add flowers and leafs as desired. Add ribbon in 4 parts or as desired. Add two feathers in chosen colours and your ready for any Easter tea party with the Easter bunny. 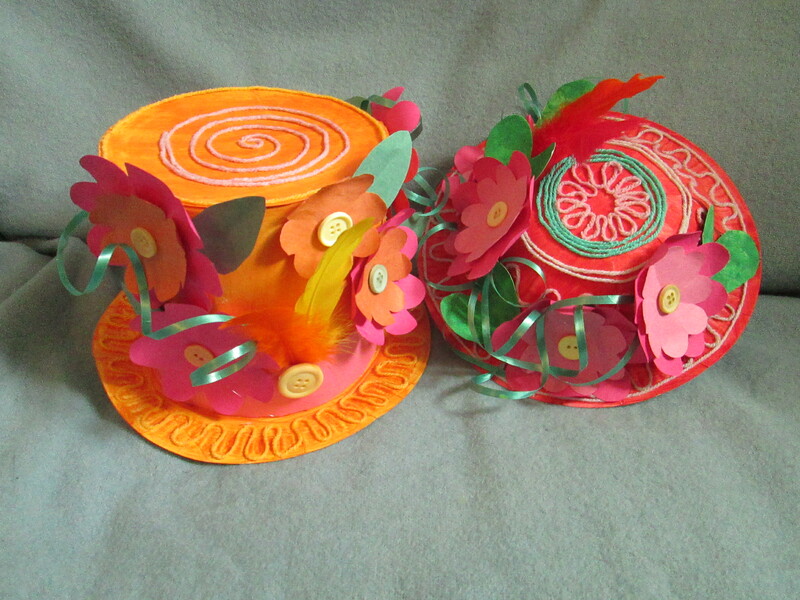 2 paper plates for the hat and one for the a palette. Start with a A2 sheet of cartridge paper. Fold in half on the horizontal. Cut in half on the fold. Fold each long edge in about 2.5cm. Cut slits as shown up to folds. This gives you the hats trim and top. Glue tabs to base of trim, with the trim/curve of the plate going upwards when sat upright. Glue overlap of the side piece. Glue top to the outher tabs on the other end. One blank canvas to paint and make with. Cut a strip of green paper from an A4 sheet about 2cm thick. Cot into small segment, I did 5 in different sizes and the cut half leaf shapes and open them up. Add wool,flowers as with first bonnet instruction above. Feathers, green party ribbon and buttons on flowers and an extra large button on feathers for top hat.